MOSCOW, Idaho – The lucky 7s had a day. The defensive front, playing without all its tricks, got after the offense early – although the honor of the offense was restored by some leaky defensive backfield work. Kaden Elliss previewed how this iron man thing might work for the Vandals, who tried out even more people on both sides of the ball. That about covers it for Idaho’s first scrimmage? It seems so. The Vandals went a game-like three hours in the Kibbie Dome on Saturday, a test of conditioning and tough-mindedness by design, according to offensive coordinator Kris Cinkovich. “Some guys responded. Some did not. We need to know, not find out on Saturday afternoon,” Cinkovich said. Charles Akanno, the linebacker who wears jersey No. 7 for the defense, responded by homesteading his 245 pounds in the offensive backfield throughout the first half of the scrimmage. Battering defenses senseless with 234-pound Isaiah Saunders and 240-pound Roshaun Johnson seems like it ought to be a good strategy for the Vandals. Saunders even scored once from five yards out. But in the early part of the workout, three down defensive linemen doing virtually no shifting gave up hardly any ground and kept the blocking off the linebackers. In turn, Akanno made an art form of the tackle for loss. Senior defensive tackle Ben Taliulu also deflected one of Petrino’s passes that was intercepted by linebacker Christian Elliss. “I just stuck my hand up, turned around, and Christian had the interception,” Taliulu said. Cutrell Haywood, the receiver who wears No. 7 on offense, grabbed four touchdowns in five catches, including taking one ball away from starting cornerback Lloyd Hightower in the end zone corner. “I’ve got to grab it. This is probably my only chance.” Haywood said he uses the phrase as a mantra to focus his attention on passes thrown his way, although it might have lost some urgency as touchdowns piled up. Among scenarios the Vandals worked repetitively was first down at the 20-yard line. Defensive coordinator Mike Breske was pleased with the way the defense tightened up near the goal line. “A major goal is to get better in the red zone,” he said. But he acknowledged the secondary played unevenly. “We got beat in some man-to-man. 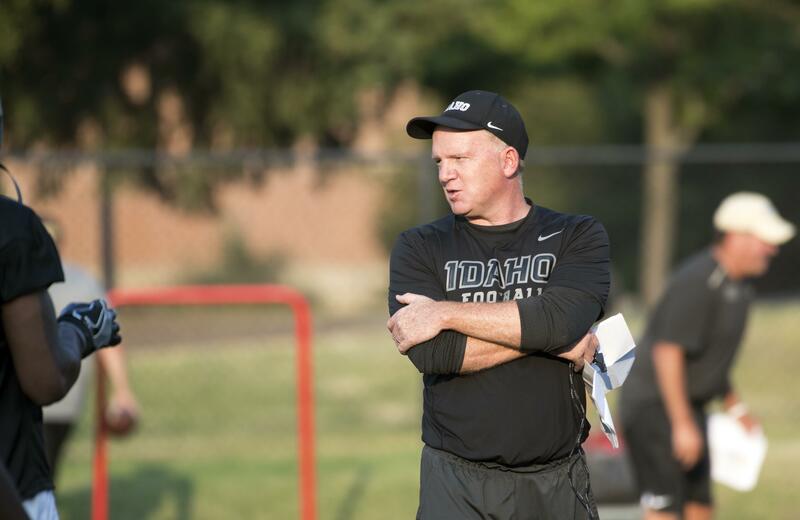 Petrino and Richardson are the contenders to become Idaho’s starting quarterback. Richardson, however, injured an ankle last week. He missed several days of practice and the scrimmage. Noah Johnson, a Phil Steele’s Preseason All-America at guard, was also out, as was senior receiver David Ungerer. Cinkovich didn’t fret about the absences. He took the position more work for the understudies is good. “You get 80 to a 100 reps for a kid who might help you win a game,” he said. Petrino went virtually the whole way at quarterback. He was only spelled on a couple of series by freshman Nikhil Nayar, who did lead the team to a touchdown. “Initially, the D got after us. Early in the scrimmage they played with more emotion,” Cinkovich said. But he praised Petrino’s elusiveness after the offense weathered that early storm and said Petrino was adept at escaping pressure and finding throwing lanes. One of his favorite targets was Elliss, who spent the first half with the offense where he caught a touchdown from Petrino, and the second half as a linebacker and defensive end. In the latter capacity, he got in on several plays with his brother, Christian, a middle linebacker. Idaho also had a pair of players from Spokane on both offense and defense. Freshman Connor Whitney, from West Valley, played at both tight end and linebacker. He even held for a couple of unsuccessful extra point attempts but had trouble controlling the snap. Jack Bamis, a junior from Gonzaga Prep, worked primarily at running back, but Idaho has also developed a defensive package for him as an edge pass rusher. It takes advantage of Bamis’ athletic ability, according to Breske, and Cinkovich said Bamis has become mature enough to handle playing both positions. Published: Aug. 11, 2018, 4:50 p.m. Updated: Aug. 11, 2018, 6:32 p.m.